Poll: Will you follow the results of the US midterm elections? Two years of a Trump presidency have heightened divisions between Republicans and Democrats. Supporters of Georgia gubernatorial candidate Stacey Abrams pictured yesterday. 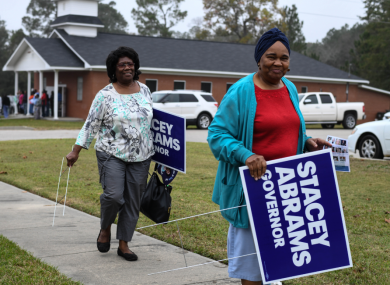 Abrams, who could became the US's first African American woman governor, is in a close tie with opponent Brian Kemp in one of the most-watched midterm races. There’s a huge amount of international interest in the US midterm elections, which are taking place today. Two years of a Trump presidency have heightened divisions between Republicans and Democrats. The entire 435-member House of Representatives and 35 seats of the 100-seat Senate are up for grabs. Currently, Republicans have a majority in both houses and the biggest midterm question is whether they will continue to hold that advantage after today. Trump’s approval rating is at 39%, according to a recent opinion poll, with Democrats hoping to capitalise on this and make up ground. Poll: Will you follow the results of the US midterms? Email “Poll: Will you follow the results of the US midterm elections?”. Feedback on “Poll: Will you follow the results of the US midterm elections?”.